Dairy Queen is ready to scratch your funnel cake itch all year around with the introduction of new Funnel Cake a la Mode as a permanent menu item. Available at participating DQ and DQ Grilled & Chill locations as part of their DQ Bakes! 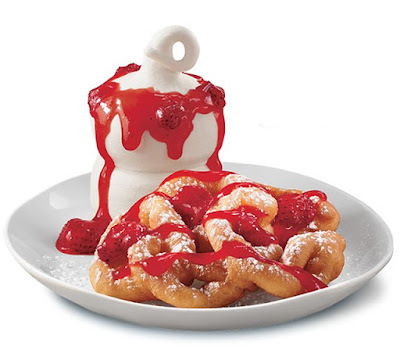 menu, the new dessert features a hot, crispy funnel cake dusted with powdered sugar with a side of vanilla soft serve, drizzled with a choice of hot fudge, caramel, or strawberry topping. Funnel Cake joins a line up of other hot desserts a la mode that includes the Triple Chocolate Brownie, Apple Tart, and Fudge Stuffed Chocolate Chip Cookie.